I want to start out with a quick apology for those of you who have been following along all month with my turning The Wall into a room. I need to post one final very photo intensive post for the challenge. It's going to contain the before and after photos as well as answering some tough questions. If you don't want to read, I totally understand! For those of you who do, let's go! Let's start with the Before photos. Just a quick reminder as to why my son is wearing shorts in February, in Michigan. He wasn't. My camera batteries died and the batteries were buried well...in there. Luckily (?) 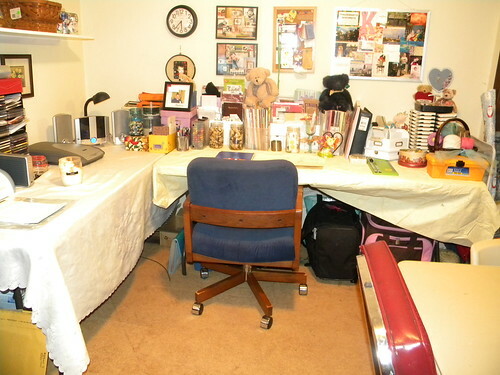 for me, the room hadn't changed at all since August when I took these photos. Well, except to get worse since we kept shoveling things in there and the cats kept coming in and knocking stuff over as they used it for their personal jungle gym. So, even though it's embarrassing to admit, these before photos make the room look better than it was. This is "The Wall." 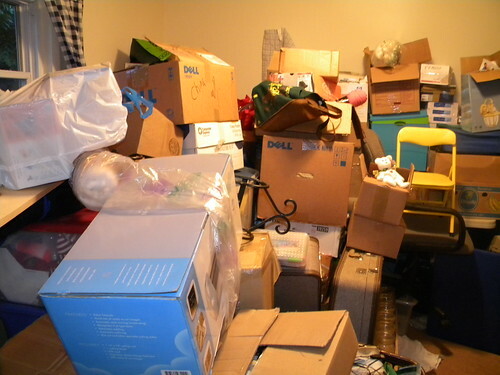 It's called that because as you can see, it was nothing more than a wall of boxes. Boxes, boxes, everywhere...and a cute kid who tries so hard to help mom get rid of those boxes (mostly so he can have them to play with.). This is "The Wall" from inside. I risked life and limb to climb in there to get this shot. There aren't any other angles simply because you couldn't move off the tiny path enough to get any other angles. But, aren't my suitcases fabulous? lol! This seemingly random shot was included to show that the nice clean spot on the floor in the first picture was totally gone by the time February rolled around. 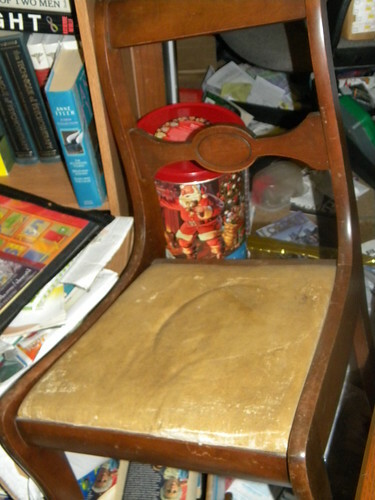 You can see the disaster around and under this poor chair (which has since had a makeover!). Now, for the after pictures. I have to say that I am incredibly proud of this makeover because all it took was hard work. I didn't put even $1 into doing this space. This is approximately the same angle as Before Photo #2. As you can see, there are no boxes. They are totally gone. This is my "tech desk" and the left side of my craft table. I hung those shelves all by myself. I had the aching muscles to prove it for two days after! All of the jars and storage items were things that I found in "The Wall" and reused! This is an angle that you couldn't see before. It's the inside wall of "The Wall". The card table is now the boys' craft and work area. There are 2 chairs (you can only see one in the photo) and each of the boxes is sorted into different categories and labeled. 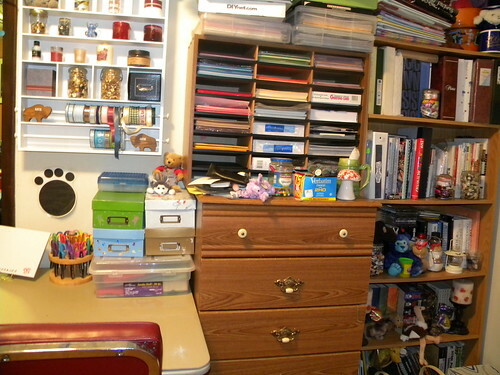 My 8.5x11 craft papers are in the paper sorter and the containers on top hold all of my 12x12 papers sorted by color. My unused albums are stored on top of the bookcase and the bookcase holds albums (finished and in progress) as well as crafting books, computer books and fantasy genre books. The box in the lower right corner is actually a Build A Bear house that our kitten has taken as her personal hideyhole. The basket next to it holds all of the cords I found while doing the room that still need to be matched up to electronics in boxes elsewhere in the house. Once they're matched up, all extras will be gotten rid of and the basket will be reused elsewhere or Freecycled. This is our PC corner. What I love best is that I got this desk (in August) from Freecycle so I didn't pay anything for it. Now that I think of it, my blue craft chair and the red desk chair were also freecycle items. The white/clear drawers hold various crafting/scrapbooking supplies all sorted by type and are labeled. The totes/baskets to the left of the desk hold office supplies and some of the boys larger crafting items that need to be stored separate from the ones on their table because they're mom supervised crafts only.I wish I had moved the desk chair. This angle makes the desk look cluttered on the corner, but it's not at all. Neither is the top of those drawers. Bad camera angle strikes again! This angle most closely matches Before Photo #1. This is from the doorway looking in. 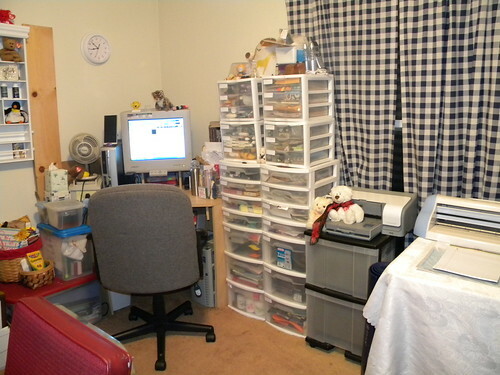 Again, you can see the "tech desk" and my craft table. Whew! The final picture of my After photos. 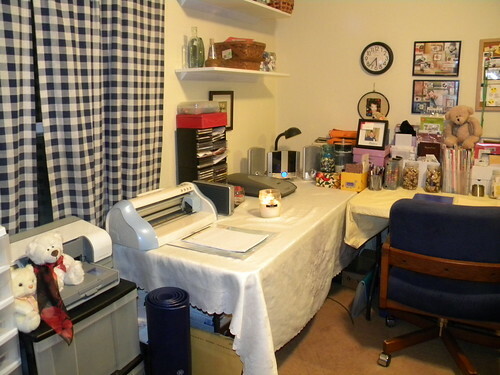 This shows the full craft desk/tech desk area. As you can see, I've stored my crafting/scrapbooking travel bags under one end of the table where they're out of sight but easily accessible if I need to pack one to go somewhere. - The hardest part...Getting into the room? Quite literally. This room was full of boxes, some of them stacked higher than my head. It was almost impossible for me to get into the room and then the challenge became where to start and now letting the whole process overwhelm me. - Everything has a place now. If I want a pair of fancy scissors, I know where they are. If I want a computer game, I know where it is. There isn't anything in this room that doesn't belong in it. Plus, now that I have it looking this good, I have no desire to see it going back to looking like a junkyard. My kids are also thrilled with the change and instead of coming in here and dumping things, they're picking up after themselves. In fact, I heard my younger one chastising his brother earlier for not picking up fast enough! - The Stuff. Yep, I think that deserves to look like a movie title. 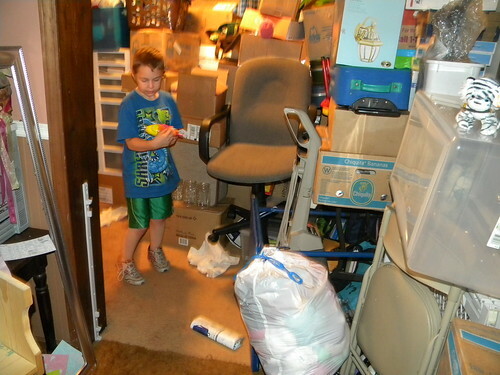 By the time I was done decluttering this room, I had freecycled over 250 pounds worth of stuff from this room. That doesn't count the approximately 5 trash bags of recycling that went out to my curb for my service to pick up. Anything else that didn't belong in the room was moved to the room it does belong to. - Yay for storage solutions! Yay for me being an organizing junkie like Laura! I didn't have to go out and buy a single basket, drawer or shelf for this space because I already had them hiding in the room. I don't know how creative any of it was because to me organizing is like breathing. It's just something that I'm good at doing. I think though that two of my ideas were maybe a little bit creative. I took old fashioned canning jars and used them to sort buttons and ribbons into. Now, I can easily see what I have and pull out just that instead of everything. I also have a free standing cd/dvd rack in the room and after I finished purging software, I didn't have enough to fill it, so I took a few of my smaller books and filled one of the top shelves with those. As for the rest of the storage, it's mostly made up of boxes and baskets and drawers. It took forever but each one has a specific purpose and now I know right where everything is! 1. I single handedly kept my local Freecycle group going for the month of February. I actually got emails thanking me for my generosity from people who weren't sucking up to get my stuff! 2. I took a wall of boxes and turned it into a space that my entire family can use. 3. I recycled enough papers and cardboard boxes to save a dozen trees from the rainforest. 4. Because my kids said I did a good job and I should win. 5. Because I've taken the momentum from this room and have been using it all over my house. This hasn't just been a declutter challenge, it's been me finding myself hiding in that disaster and turning my home into my sanctuary. I'm finding the woman who let perfectionism and depression fill her house with stuff and loving her and taking care of her instead of berating her for letting things get to this point. I'm reminding her that she is a strong woman who is loved and who can do anything she wants to..she just has to take the steps. My awakening is the Freecycle world's gain! Wow, that got pretty deep there at the end but you know, that's ok. If you managed to read all the way here to the end, thank you. If you didn't..well, if you didn't you're not reading now, are you? *grins* I don't know if I'll win, but it was worth going through this process anyway. I'm not done with my cleaning or purging and I'm sure there will be more posts about it in the future. Stick with me folks and we'll all get there, one room and babystep at a time! My thanks to Laura over at OrgJunkie for hosting this challenge! Nicely DONE! I think you deserve a drink of your choice and a day on the beach...or maybe I'm just projecting my wishes on you! Great job either way! I definitely need to look into freecycle...never heard of it before! And the cricut is front and center. Glad to see your priorities are in the right place. Good job! Very nice! I'd love to have a work space like that! Great job! wow! I'm impressed. GREAT work! That is an amazing job transformation you have completed! WOW! I love your room! You did a great job - congratulations! Well, you have heard my comments on the room prior to this, but I love it. I am so happy for you and proud of you! You and the boys all have a great room to create and have fun in. That's what family is about. You have done an incredible job! It was great going through this process with you. You kept me motivated as well - with your weekly posts. I had to try to keep up with you on that one! :) So thanks to you, we both got new rooms to create in! And the five reasons was nicely written. I like the balance of humor and deeper thoughts. Wow, major transformation there! Kudos to you, I think you DO deserve a vacation after all that work! Nice! Awesome job! You should be proud of your room! This space looks great! You did an AWESOME job. You did AWESOME, I'm so happy for you. Now you can start playing. I can hardly wait to see what you do with your Pazzles...isn't it great that you didn't have to worry about organizing any cartridges or dies? And look at those baskets and I love the wall with your clock. I'm so glad you did this...now I need to go clean mine, which shouldn't take long since I did this a while back and it is easy, because everything has a place. For lack of better words.....HOLY CRAP! I mean, I would read once in a while on here where you'd talk about THE WALL, but I had never seen the BEFORE photo so I just thought it was a wall of boxes lined up...not an entire freaking ROOM. WOW!~ You rock, girl! And good for you to take that momentum and do the rest of the house too. That's what I always do myself. Once I get going, I keep going! Katie--I know how hard it is to do this as I've been attacked by the wall too so I'm very proud of you! Pat yourself on the back. Put those before pictures up somewhere as a reminder of how far you come and to help you NOT go back!! 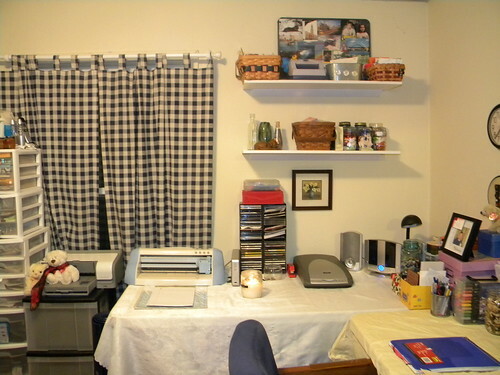 It would be so cool to have a craft room! Great job, everything looks so neat and organized! Wow! Awesome! That's a lot of hard work right there! Way to go! Isn't an amazing feeling to have transformed a mess into a masterpiece? I'm ready to start on another room now. This is the biggest transformation I've seen yet, I definitely think you deserve a prize--you couldn't even walk in the room before! Fabulous job, way to go! Amazing! What a transformation. It must be such a wonderful feeling of accomplishment every time you walk into the room. You did a great job transforming your room! Love your new crafting space!